When I was a little girl, my Mum used to say that my pocket money could "kittle": I don't know if this is a local word, or just a family word, but it means that she thought it could reproduce on its own; and it was her way of saying she had noticed that I was a good saver. When The (Not So) Small One was a little girl she liked to work her pocket money hard; and because she was always trying her best to spread what she had round all the many things that caught her eye, she started getting interested in the coins themselves. Holding them in her hand, sorting the shapes. Sometimes she would discover in her spare change that a foreign coin had slipped through, and this never bothered her. She understood that she wouldn't be able to spend it. But its difference made it desirable, and she saved it up, put it in a special jar and called it her "obbley-dobbley" money, and that was probably a mixture of "odds and ends" and "bit and pieces". She liked to spread it all out and enjoy the subtle differences. ...though maybe that's a little unfair. Because last night, complete coincidence, she started talking about how much she had saved for this year's holiday, and how the exchange rate might have shifted by the time we get to the summer. Maybe she did take in what he was saying. One thing's for sure: she has never forgotten the day she finally got to spend some funny money. This seemed like the perfect subject for a Get It Scrapped page using a sprinkling of embellishments. Thinking about that bank, I couldn't get out of my head an image of Mrs Olsen in Little House on the Prairie, striding through town on her way to bank the shop takings, so this layout ended up a little bit Cowboy Victorian, with some lace and velvet ribbon for her bonnet and a wood siding background. I did cut out a few more "£" signs, but in the end decided less was more. I'm glad I made her pose for a picture with those coins. because, of course, she had to swap them back when we came back ..to the future. I like the scattering too - glad you took a photo too! I love that word as well......and what a lovely story. Kittle is a new word for me. The Boy Child still has yet to grasp the concept of money. He thinks there is an endless supply of it in my purse! A fun story to read about. Love this LO with the trail of embellishments. It is my all time favourite way to embellish. I love to lead the eye through the page. Oh, that's interesting, my MIL uses a similar word "quiddle" to mean the same thing as your Mum. Perhaps that's the Somerset version of "kittle". I've never heard that word before. But I am old enough to remember half a crown and threepenny bits! What a great story & layout! I love the image of Mrs. Olsen inspiring your design choices. A really interesting layout, Sian, and I love your weathered background. I'm still undecided whether you've constructed your layout on a park bench, or whether you have a brilliantly photographic piece of paper! Perhaps we could start a new fashion: outdoor 'found' scrapbooking :). 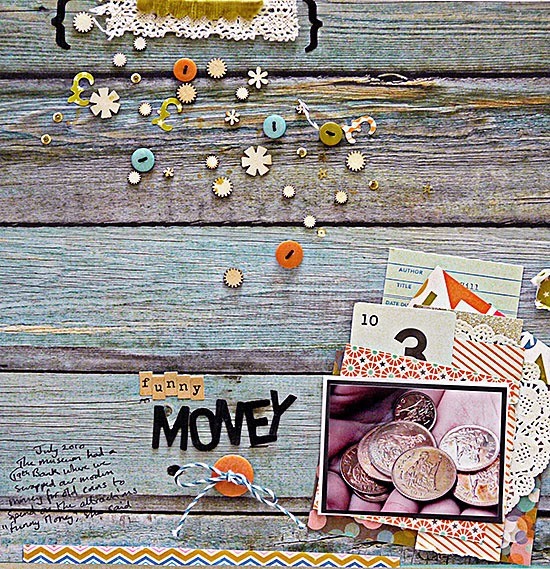 I love everything about your layout---subject matter, layers, sprinkling of embellishments---it's as if "the not so small one" tumbled those coins out of her little hands and they dribbled down the page! 'kittle' is anew word or me too...and I too love the layout..especially that trail of buttons! I enjoyed the mix of English and American references in this post--blogging does make a for a small world, doesn't it? I also had a chuckle over your mother noticing how well you saved. She was probably thinking money-ish, but you are obviously a saver on many different levels. Lots of interesting new words for me here ;) and a great page with a beautiful sprinkling of embellies! Also totally in love with wood background lately! Really cute! I love, love, love old coins and foreign coins. I could definitely become a collector if I wasn't careful. Love your spray of embellies. I wonder how difficult the sticking bit would be. My browser has been difficult about commenting lately. Hope this works. Oh yes we had a little girl who was absolutely delighted with changing money when we went to Blist Hill Museum. such a pretty page. I'm sure i have lots and lots of coins tucked away here and there in my memory boxes - I remember distinctly stashing my first 20p and old shillings and halfpennies when i was aware of how "special" they were - you have me inspired. I wonder where there are! My kids love to play with my collection of foreign coins, especially the oddly shaped ones with many sides or holes in the middle. They would love our money to look like that. LOVE this layout! Loved it even more after I read the story about how it reminded you of Little House on the Prairie! My girlie loves coins too. That is a great story! I still have all the foreign coins I collected as a kid. Another great story told, and lovely layout created! What a gift you are leaving for your kids! You write so beautifully Sian and I think this is one of my favourite of your Lo's. What a delightful story and layout. That was so great that you managed to get a shot of her holding the old money. Btw, I like your Mum's word.